The International Fragrance Association (IFRA) recommends that Cinnamaldehyde (the chief constituent of Cinnamon Bark oil) be limited to 0.05% (about 1 drops per 3 ounces of any other carrier oils) for leave-on products like ointments, creams, and lotions. Since Cinnamon Bark oil is approximately 75% Cinnamaldehyde, the recommended maximum for Cinnamon Bark oil is 0.07% (approximately 1 drop in 2 ounces of any other carrier oils). There is no restriction for body washes, shampoos, soaps, and other wash-off products because the oil does not remain on the skin. Cinnamomum zeylanicum originates in Sri Lanka. It is a tropical evergreen tree of the laurel family growing up to 15 m (45 feet) in the wild. The tree has a very thin smooth bark, with a light yellowish brown color and a highly fragrant odor. Its pleasant scent makes it, in small amounts, a spicy addition to creams, lotions and soaps. Although it is an indispensable spice and herbal remedy, Cinnamon is reported for negative effects including possible skin issues like allergic reactions, irritation of the skin, stimulating menstruation, contracting the uterine muscles, skin sensitization, dermatitis and burning sensation. According to the Scientific Committee on Cosmetic Products and Non-Food Products (SCCNFP) the presence of Cinnamaldehyde in any ready to use products should not surpass 0.1%. Studies report severe burns in people due to the skin contact of undiluted Cinnamon oil and is commonly related to burning sensation in the skin, mouth, mucous membrane stomach and chest , intermittent blistering, nausea, dizziness and sensitization accounted to the presence of Cinnamaldehyde. This also applies to the use of Cinnamon oil in vapor therapy and dermal application. 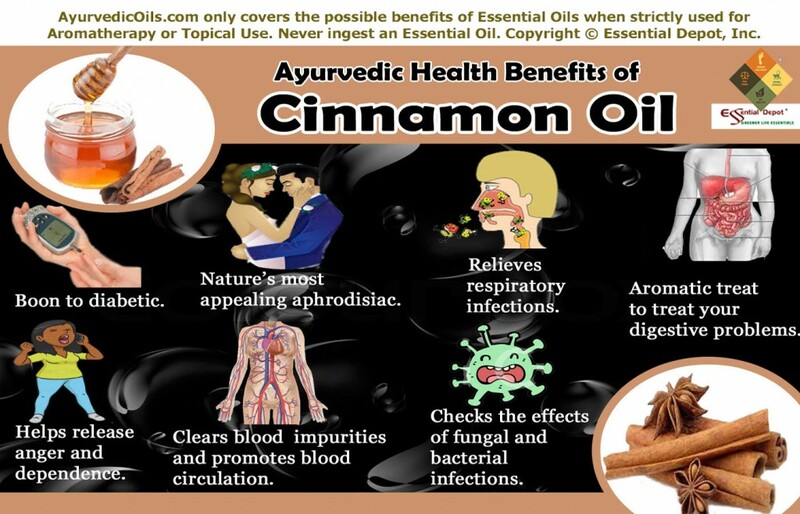 Visit AyurvedicOils.com for more information on the traditional ayurvedic and aromatherapeutic uses of Cinnamon Oil. Learn about the natural chemical components that give Cinnamon Oil its fragrance and therapeutic characteristics. The traditional remedial properties of Cinnamon essential oil are antioxidant, astringent, antibacterial, antimicrobial, anti-clotting, anti-fungal, cardiac, emmenagogue, stimulant, analgesic, antibiotic, vermifuge, tonic, aphrodisiac, stomachic, diaphoretic, diuretic, anti-parasitic, alterative, expectorant, antispasmodic and carminative. The International Fragrance Association (IFRA) recommends that Cinnamaldehyde (the chief constituent of Cassia oil) be limited to 0.05% (about 1 drops per 3 ounces of any other carrier oils) for leave-on products like ointments, creams, and lotions. There is no restriction for body washes, shampoos, soaps, and other wash-off products because the oil does not remain on the skin. Cinnamomum cassia, also known as Chinese cinnamon or Chinese cassia, originated in South China. This tree serves several purposes and is hence widely cultivated in India, Indonesia, Laos, Malaysia, Taiwan, Thailand and Vietnam. With its celebrated use in the Traditional Chinese Medicine, Cassia is regarded as one among the 50 fundamental herbs of China. Cassia Essential Oil has a pungent, warm scent from its 1% to 2% volatile oil that is mainly responsible for the spicy aroma. It is a strong top note. The adverse skin reactions of Cassia or the Chinese Cinnamon oil are dermal irritation, mild to severe skin sensitization, irritation of the mucous membrane and dermatitis. Cassia oil is said to exhibit no phototoxic effects but is emmenagogue in nature and might cause contraction of the uterine muscles, which is hazardous to the wellness of the fetus and the pregnant women. The key chemical constituents that are responsible for the possible skin and other undesirable health issues of Cassia oil are cinnamaldehyde, cinnamyl acetate, cinnamic acid and cinnamyl alcohol. These components have been studied for causing acute and subchronic toxicity. Studies state that cinnamaldehyde, cinnamic acid and cinnamyl alcohol may cause allergic reactions, irritation, sensitization and dermatitis when the skin is in contact with products like liniments, mouthwashes, toothpastes and creams. Cassia oil may provoke debility, itching, irritation, insomnia, and depression in some people. This mainly occurs when the use of Cinnamaldehyde exceeds the maximum safe level of usage. The highest recommended level by the International Fragrance Association (IFRA) for Cinnamaldehyde is 0.05% for most leave-on products. When used in vapor therapy and topical application beyond the recommended usage level, Ccnnamaldehyde, cinnamyl acetate, cinnamic acid and cinnamyl alcohol are said to contribute to the irritation of mucous membrane and are accounted for hepatotoxicity (toxic, irritant and might cause damage to the liver), mutagenic (alteration in the structure of DNA), reproductive toxicity (research supporting significant fall in the number of nuclei and changes in the allotment of embryos in pregnant mice) and restrain platelet aggregation, a vital part of the blotting clotting process. Undiluted or concentrated Cassia oil have been shown to cause severe irritation in rabbits in certain studies and few other studies involving consecutive patients with dermatitis, few people were sensitive to 2% Cassia oil on patch testing. Always ensure to dilute Cassia oil in appropriate carrier oils before topical use and never ingest essential oil as they may be toxic to the system. 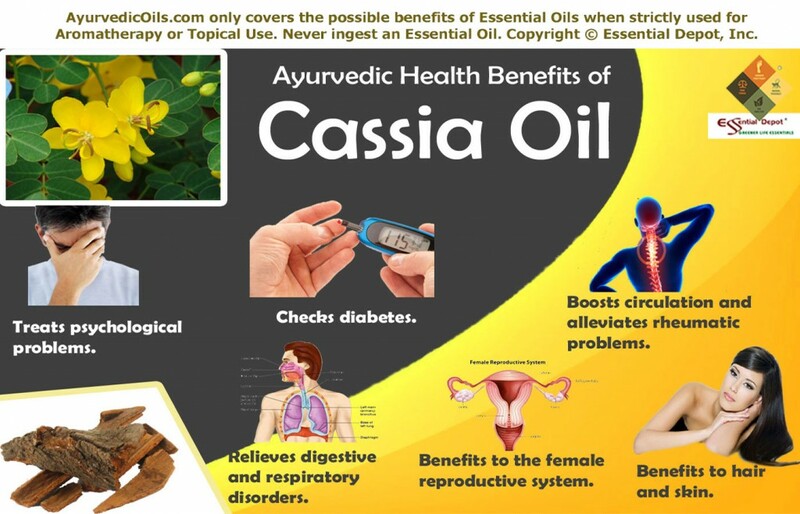 Visit AyurvedicOils.com for more information on the traditional ayurvedic and aromatherapeutic uses of Cassia Oil. Learn about the natural chemical components that give Cassia Oil its fragrance and therapeutic characteristics. Ayurveda prescribes Cassia for the treatment of menstrual problems, nausea, respiratory infections, gastro-intestinal problems, depression, loss of libido, rheumatism, diabetes and indigestion. Cassia is botanically called as Cinnamomum cassia and is a member of the Lauraceae plant family. Ayurveda: Life, Health, and Longevity by Robert E. Svoboda B.A.M.S. Camphor essential oil should not be confused with the compound of the same name. The crude exudate of the camphor tree contains about 50% of the compound, camphor. Camphor essential oil is distilled from this exudate and contains very little camphor. Instead, it contains mostly limonene, p-Cymene, a-Pinene, and 1,8-Cineole. The Camphor tree can grow up to 35 meters (100 feet) and camphor is found in every part of it. The Essential Oil is extracted by steam from the chipped wood, root stumps and branches, and is then rectified. White camphor oil is the first distillation’s fraction. In China and Japan, Cinnamomum camphora must be at least 50 years old to produce oil, and can often grow as old as a thousand years. The wood has been used in the construction of temples and in ship-building because of its durability and aromatic properties. Camphor oil has been determined to be toxic in various studies, when used in excess of the prescribed quantity. According to the safety report, the acute toxicity of Camphor oil is said to be exhibited by contact with the skin, eyes, inhaling and ingesting, and ingestion of Camphor oil should be avoided strictly mainly due to its chronic effects on the liver (hepatotoxic – toxic to the liver). Using Camphor oil topically might also cause skin sensitization, irritation, skin allergies like hives, itching, rashes, swelling of the face and lip dryness. Camphor oil used as direct contact with the skin without any dilution in appropriate carrier oils is considered a dangerous skin irritant. Never use Camphor oil on cuts, broken or peeled skin. 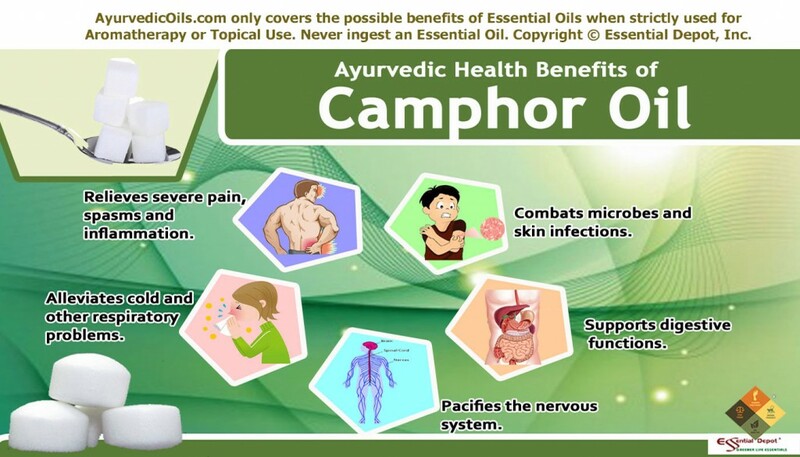 Visit AyurvedicOils.com for more information on the traditional ayurvedic and aromatherapeutic uses of Camphor Oil. Learn about the natural chemical components that give Camphor Oil its fragrance and therapeutic characteristics. Aromatherapy & Health Uses: Coughs; Colds; Fevers; Rheumatism; Arthritis. Traditionally, both the leaf and crystallized extract are used for wet lung conditions such as asthma and bronchitis. Camphor is useful in depression, exhaustion, and stomach cramps and to improve circulation. Camphor is incorporated into salves for external use to kill parasites and treat ringworm, scabies, and itch. The oil open the lungs, making breathing easier, and helps with muscular and joint pain, arthritis, and bruises -not for open wounds. The salve functions as a “smelling salt,” and the herb has been used internally to revive those in coma or delirium. Camphor can be burned to purify the air or inhaled to open lung passages. Caution: Do not use this herb if you are pregnant or if you are very weak and debilitated. Only natural plant extracts should be used, as chemical camphor is contaminated with industrial poisons. Other Uses: In solid form Camphor is added in small amounts to Lunar and Chastity type mixtures, Eucalyptus or Lavender oil may be substituted. Divination; Prophetic Dreams; Psychic Awareness. Burn in the home to purify the air and to dispel disease. Tisserand and Young recommend that Calamus oil be limited to 0.2% (about 1 drop per ounce of any other carrier oils) for leave-on products like ointments, creams, and lotions. There is no restriction for body washes, shampoos, soaps, and other wash-off products because the oil does not remain on the skin. The European Council files β-asarone as “substances which are suspected to be genotoxic carcinogens and therefore no MDI can be set”. According to the 1988 European Community Council, both the European Union and the United Kingdom ‘Standard Permitted Proportion’ of beta-asarone in food flavorings must be 0.1 mg/kg. Essential oils are highly concentrated substances and must be used in a diluted condition with safe carrier oils like coconut oil. It is meant only for topical application, and it is not recommended to take essential oils internally. 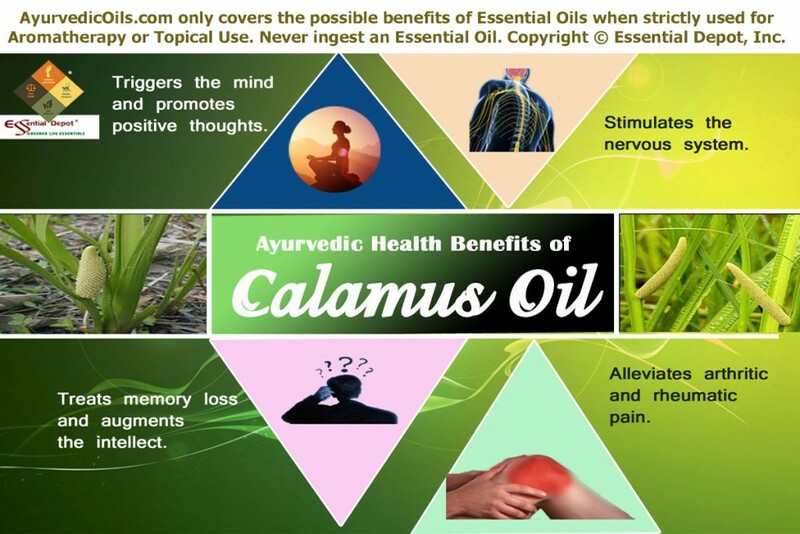 Visit AyurvedicOils.com for more information on the traditional ayurvedic and aromatherapeutic uses of Calamus Oil. Learn about the natural chemical components that give Calamus Oil its fragrance and therapeutic characteristics. The International Fragrance Association (IFRA) recommends that Bergamot oil be limited to 1.25% (about 7 drops per ounce of any other carrier oils) for leave-on products like ointments, creams, and lotions used on skin exposed to sunlight. There is no restriction for body washes, shampoos, soaps, and other wash-off products because the oil does not remain on the skin. Bitter orange oil exhibits mild photosensitivity effects if the oil is oxidized, which might cause irritation and hyper-pigmentation of the skin when skin is exposed to sunlight within 12 hours of usage. The major cause being the response of the chemical components that are photoactive in nature attracts light and ends up in toxicity via molecular alterations. The safe dermal use level of Bitter orange oil by the International Fragrance Association (IFRA) is 1.25%, specifically to avoid phototoxicity in the products used for topical application and not for soaps, shampoos and other bath preparations. This No-observed-adverse-effect-level (NOAEL) is based on various studies with Bitter orange oil on mice and swine, where the No-observed-effects-level (NOEL) was found to be 6.25%. Bitter orange oil is Generally Recognized As Safe (GRAS) by the FDA (Food and Drug Administration). “There are no contraindications but that photosensitization may occur in fair-skinned individuals,” quotes The German Commission E monograph for Bitter orange peel. The major chemical constituent responsible for the skin sensitization and mild irritation of Bitter orange oil is Limonene, which accounts to about 90% of this oil, and certain other furanocoumarins. According to European regulations, essential oils with furanocoumarins should be used in such a way that the overall level of bergapten does not exceed 15 ppm (parts per million) in ready-to-use cosmetic products meant for use on the skin surface that are exposed to sunlight (other than wash-away products) and 1 ppm in sunscreen and bronzing items. 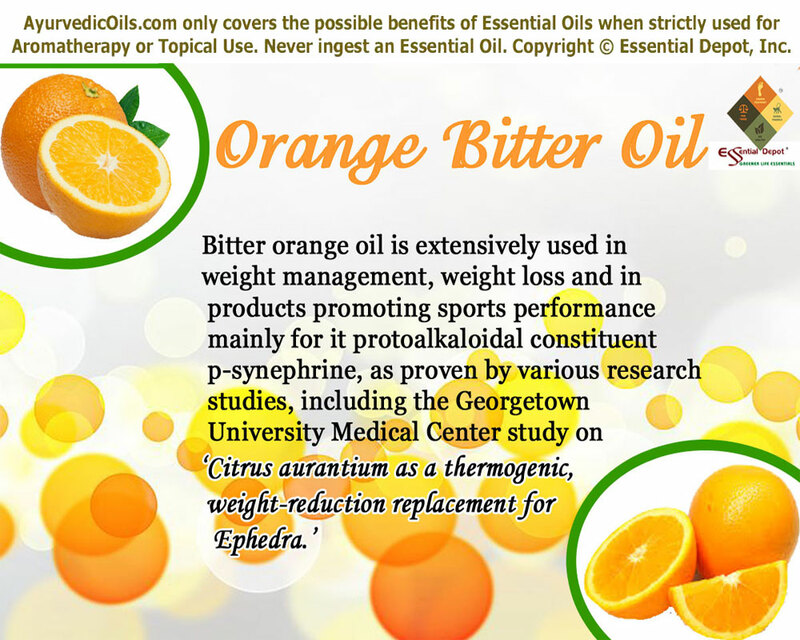 Use Bitter orange oil only for external use. Iingestion of this oil should be avoided strictly, as internal use of this oil has adverse effects according to various reports. Medical research studies state that the presence of stimulants like octopamine, amines synephrine (an alkaloid with almost the related chemical structure to ephedrine in Ephedra – Ma-Huang) and N-methyltyramine are responsible for the cardiovascular toxicity of Bitter orange and this is also reported to cause increase in blood pressure and vasoconstriction. Bitter orange should be avoided by patients with tachyarrhythmia, hypertension and narrow-angle glaucoma, mainly due its potent to cause additive effects. Overdose of synephrine in children overdose ended up in tachycardia, nausea, quick increase in blood pressure and irritation. Certain researches witness the effect of Bitter orange in restraining human cytochrome P450 3A (CYP3A) in the test tube studies. Just like Grapefruit, Bitter orange is said to hold back a vital enzyme in the small intestine, and this may possibly have an effect on the levels of blood, when taking certain medications like antiviral, anti-anxiety, antidepressant drugs, statins and calcium channel blockers and along with the intake of caffeine. Care should be taken if Bitter orange oil is used in massage in the abdominal area, as essential oils penetrate quickly through the skin, reach the bloodstream and may cause adverse effects. It is not recommended to take Bitter orange products when using other prescribed medications, except under strict medical supervision. Furocoumarins are also used in various remedies on par with long-wave ultraviolet light therapy for the healing of mycosis fungoides, vitiligo and psoriasis. Visit AyurvedicOils.com for more information on the traditional ayurvedic and aromatherapeutic uses of Orange Bitter Oil. Learn about the natural chemical components that give Orange Bitter Oil its fragrance and therapeutic characteristics. The International Fragrance Association (IFRA) recommends that Bergamot oil be limited to 0.4% (about 2.4 drops per ounce of any other carrier oils) for leave-on products like ointments, creams, and lotions used on skin exposed to sunlight. There is no restriction for body washes, shampoos, soaps, and other wash-off products because the oil does not remain on the skin. The risk of phototoxicity is reduced for Bergamot oils that are furocoumarin-free or bergaptene-free (designated FCF). Botanically called as Citrus bergamia, Bergamot is a member of the Citrus family Rutaceae. The rich, herbaceous and fruity-aromatic essential oil is cold pressed from the rind of the Bergamot fruit. The thin, smooth peel yields Bergamot oil for “true” eau de Cologne and Earl Grey Tea. The Bergamot tree can grow up to four meters high, with star-shaped flowers, and smooth leaves, bearing citrus fruit resembling a cross between an orange and a grapefruit, but in a pear shape. The fruit ripens from green to yellow. The name Bergamot is derived from the city Bergamo in Lombardy where the oil was first sold. Bergamot oil has photosensitizing effects. This may cause irritation and burning of the skin when exposed to sunlight up to 72 hours after the topical application of this oil. This applies to direct skin applications like massage oils, balms, creams and lotions and not for cleansing products like shampoos and soaps. Studies establish that the phototoxic chemical constituents in Bergamot oil are Bergaptene, Bergamotene and other furocoumarins. It is also stated that furocoumarins (Psoralens) contribute to carcinogenic, photomutagenic, phototoxic and melanogenic properties of Bergamot oil. These compounds absorb ultraviolet radiation (UV rays A and B), which might cause negative reaction on the skin, leading to chronic sunburn, skin irritation, hyperpigmentation, development of skin lesions, Berloque dermatitis, alterations in the cellular structure of the skin. The resulting burns (like any sunburn) increase the risk of skin cancer. Surprisingly, Furocoumarins are also remedially used in combination with long-wave ultraviolet light therapy for the treatment of vitiligo, mycosis fungoides and psoriasis. 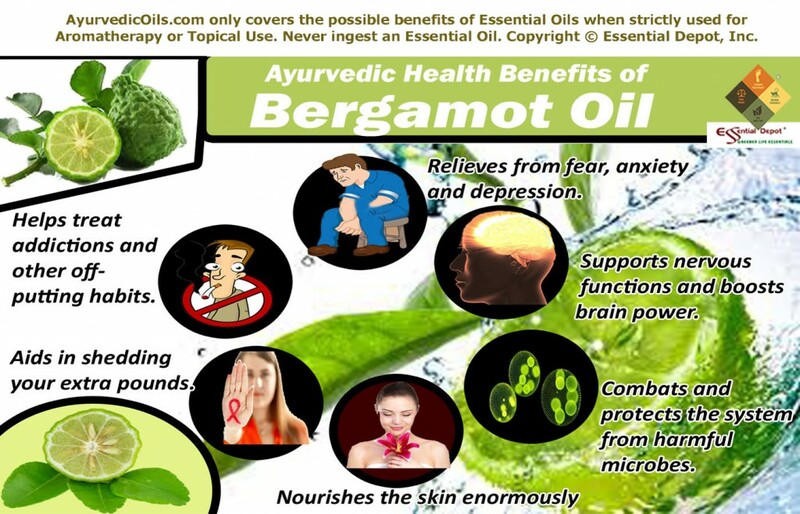 Visit AyurvedicOils.com for more information on the traditional ayurvedic and aromatherapeutic uses of Bergamot Oil. Learn about the natural chemical components that give Bergamot Oil its fragrance and therapeutic characteristics. The traditional remedial attributes of Bergamot oil are anti-depressant, sedative, antiseptic, analgesic, anti-parasitic, anti-inflammatory, febrifuge, antibiotic, vulnerary, cicatrisant, disinfectant, deodorant, antispasmodic, vermifuge, relaxant, anti-infectious and stimulant. Aromatherapy & Health Uses: Boils; Cold Sores; Insect Bites; Spots; Varicose Ulcers; Colds; Flu; Fevers; Acne, Tension, Wounds; Coughs; Stress; as an Antidepressant; as an Insect Repellent; Depression; Cystitis; Infectious Diseases; Tonsilitis: Loss of Appetite. Other Uses: Used for money and protective rituals. Add the distilled bouquet to your bathwater for these purposes. Synthesized versions of the oil abound but should not be used. Tisserand and Young recommend that Bay Laurel oil be limited to 0.5% (about 3 drops per ounce of any other carrier oils) for leave-on products like ointments, creams, and lotions. There is no restriction for body washes, shampoos, soaps, and other wash-off products because the oil does not remain on the skin. Alternative Name: sweet bay, bay tree, baie, daphne, grecian laurel, laurel, laurier d’apollon, laurier sauce, lorbeer, noble laurel, roman laurel. Bay is an evergreen tree which can grow up to 20 meters high with dark green, glossy leaves and black berries. Bay was very popular with the Romans, who thought it was a symbol of wisdom, peace and protection. The Latin laudis means ‘to praise’, which is why the victors at the Olympic Games were presented with a laurel wreath made of bay leaves. The key chemical constituents responsible for the possible skin issues of Bay Laurel oil are eugenol and methyleugenol. Although it is an excellent decongestant and antiseptic, eugenol in undiluted Bay oil can cause rashes, itching, irritation of the skin and the mucous membranes, when applied as a decongestant ointment or during inhalation of the concentrated oil. Always dilute Bay Laurel oil with an inert carrier oil and perform a patch test on your skin before using it for dermatological purposes. Numerous studies state that Bay oil has cytotoxic effects, which means it can be toxic or deadly to cells. 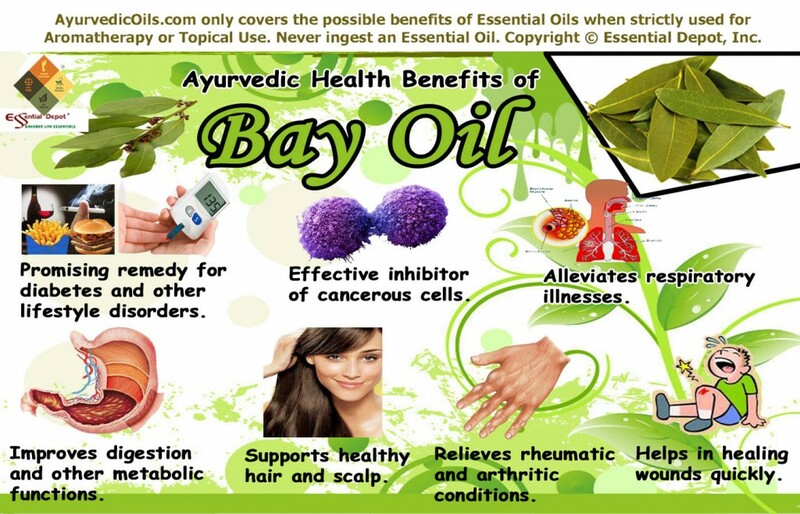 For this effect, Bay oil is used therapeutically in Apoptosis or a genetic line up for controlled cell death, especially in the treatment of Cancer. Chemotherapy (treatment of cancer) solely depends upon the potential of cytotoxic remedies to destroy the existing cancerous cells and thwart the rapid reproducing ability of cancer cells (Antiproliferative ability). According to the European Commission’s scientific committee opinion on Food, Methyleugenol displays genotoxic and carcinogenic effect and should be limited in products that remain on the skin. Bay Laurel is often confused with other members of the Laurel family like Mountain Laurel, Cherry Laurel, which are potential toxic agents. It is also confused with Westy Indian Bay. Visit AyurvedicOils.com for more information on the traditional ayurvedic and aromatherapeutic uses of Bay Oil. Learn about the natural chemical components that give Bay Oil its fragrance and therapeutic characteristics. Bay leaf is known as Tejpatta (Indian Bay leaf or Cinnamomum tamala) in Ayurveda, and it has been used in the treatment of scalp dryness, migraine, amenorrhea, neuralgia, headache, asthma, poor memory, kidney infections, joint pain, uterus infection, arthritis, high blood sugar, menstrual difficulties, flatulence, stress, indigestion, diabetes and certain respiratory problems. The wood is used to give an aromatic tang to smoked foods, and oil of Bay, from the fruit, flavors some liqueurs. A leaf decoction added to bath water will relieve aching limbs, and diluted leaf essential oil can treat sprains and rheumatic joints but may irritate the skin. The leaf and berry are used in salves for itching, sprains, bruises, skin irritations, and rheumatic pain. The fruit and leaf are simmered until soft and made into a poultice with honey for chest colds. Bay leaf and berry tea makes a bath additive that helps the bladder, bowel, and female reproductive organs. Use two tablespoons per cup and steep for forty-five minutes; add to bath water. Aromatherapy & Health Uses: Sprains; Colds; Flu; Insomnia; Rheumatism. Other Uses: Bay leaves were used by the Delphic priestesses. The incense and the leaf are said to produce a prophetic trance. Burn for psychic powers, purification, wish magic, exorcism, healing/health, protection, divination, visions, clairvoyance, energy, power. The International Fragrance Association (IFRA) recommends that Angelica Root oil be limited to 0.8% (about 5 drops per ounce of any other carrier oils) for leave-on products like ointments, creams, and lotions used on skin exposed to sunlight. There is no restriction for body washes, shampoos, soaps, and other wash-off products because the oil does not remain on the skin. Angelica root oil is said to exhibit phototoxic effects, resulting in irritation of the skin, redness, allergies, sunburns, blisters, hyperpigmentation and photodermatitis or Berloque dermatitis. These skin maladies might occur if your skin is exposed to sunlight after the dermal application of this oil within 12 to 36 hours of usage. The underlying principle is the reaction of plant furocoumarins or Psoralens present in Angelica Root oil, namely angelicin. This component makes skin more prone to sunburn. Phototoxic, carcinogenic, genotoxic and mutagenic effects all follow from the increased risk of sunburn. The International Fragrance Association (IFRA) says that the safe level of dilution for the use of Angelica root oil on the skin exposed to sun is 0.8%, which is about 5 drops per ounce of any carrier oils. 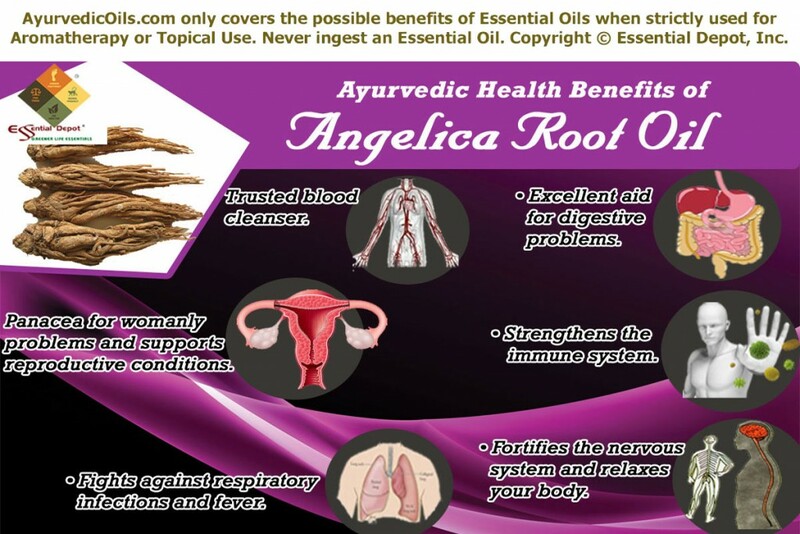 Studies suggest that Angelica root oil should be avoided by pregnant and lactating women mainly due to its phototoxic, emmenagogue and abortifacient properties, as it might cause changes in the cellular structure of the fetus, induce menstruation and lessen the supply of milk (anti-galactogogue) in nursing mothers. The most comforting note is that the coumarins are not the major constituents of Angelica root oil, and while caution should be used for leave-on products like lotions and creams, it is generally safe for wash off products like soaps, shampoos, and other bath preparations..
Furocoumarins are also used along with long-wave ultraviolet light treatment in the diagnosis of T-cell lymphoma, vitiligo, psoriasis and mycosis fungoides. Visit AyurvedicOils.com for more information on the traditional ayurvedic and aromatherapeutic uses of Angelica Root Oil. Learn about the natural chemical components that give Angelica Root Oil its fragrance and therapeutic characteristics.